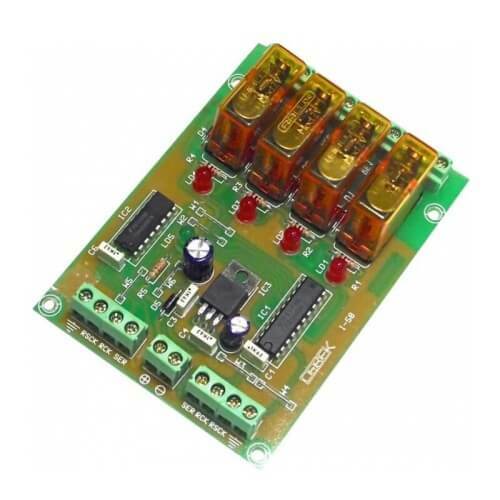 This expansion module provides an additional 4 relay outputs for the Cebek I-57 8 Channel Flexible Sequential Relay Controller Module which can be expanded to a maximum of 256 channels. Multiple expansion boards can be daisy-chained together using the onboard communication connector (use 4-core cable like our Order Code 804.859). Please refer to the I-57 product page for full operational information. An 8 channel version of this board is available Cebek I-59. Load (Resistive) 5 Amps @ 230Vac max.